Yes, that’s right. Mr. Manhattan is about to take a vacation on the lovely and cocktail culturally important island of Curaçao. I am sure to make a visit to Mansion Chobolobo, home to Senior Curaçao de Curaçao while I’m there. I’m also certain to get my share of diving and swimming and generally loafing about. I will be disconnected from the electronic teat we call the internet while away. I’ve got a number of new posts on the back burner including one last exotic citrus discovery and a preview of the amari seminar at Tales of the Cocktail. Look for ’em when I return. And keep those pre-orders coming in. In the meantime, those of you at the Manhattan Cocktail Classic may bump into some of our spies friends distributing a lovely little postcard for Left Coast Libations. For those of you less fortunate, here’s what it looks like. I want to start by saying that BARSmarts Advanced (and to a lesser degree its on-line only kin, BARSmarts Wired) is a serious undertaking. There’s a lot of material to learn and cramming for the exams, especially the final written test, would be foolhardy. That being said, I feel the time and effort I put into this program (many hours over several weeks) was totally worthwhile. 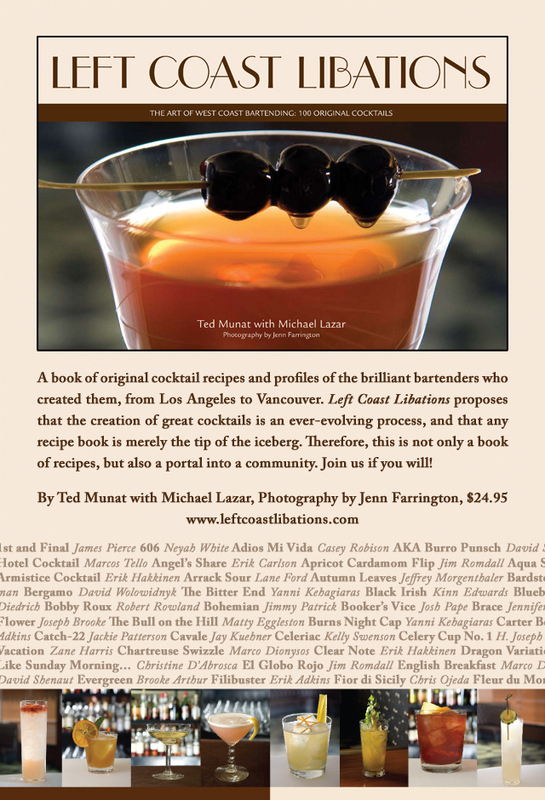 Through the workbook, the DVDs and the on-line testing modules my knowledge of spirits, cocktail history and even practical aspects of barkeeping were greatly enriched. Through the Live day I then had the opportunity to interact with some of the best and brightest people in the business: the BAR Partners(*), BAR alumini (**), and my fellow Advanced students. 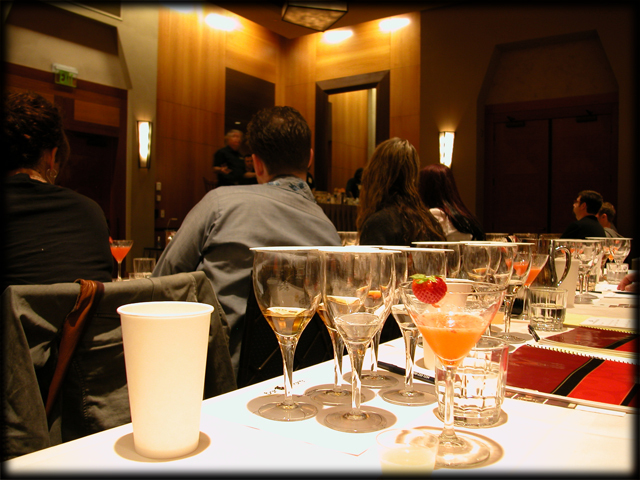 While the ultimate value of the certification (which not everyone is guaranteed to obtain) might be unclear, there is no question that this is an experience from which I have and will continue to benefit as a cocktail professional. (*) – Paul Pacult, Dale DeGroff, David Wondrich, Doug Frost, Steve Olson, and Andy Seymour are the six gentlemen who run Beverage Alcohol Resource, the organization who helped develop this curriculum for Pernod-Ricard. (**) – Graduates of the week-long certification program given by BAR once a year in NYC. The alumni helped out through the day (often working behind the scenes) and served as judges during the practical exam. I also want to send some props to the Pernod-Ricard production team. I think this was the very biggest Live event ever produced, with roughly 130 participants. The day went very smoothly, things were kept more or less on schedule, and if there were any major snafus, I was not aware of them. Thanks to you all! So first off, I should say that with the exception of the Live day, the BARSmarts Advanced and Wired programs are more or less identical. Participants in both programs are expected to learn the same materials (organized into four modules) and are tested the same way, via on-line timed tests. Wired students, having passed all four of the on-line tests then take one further on-line exam using a Flash-based ‘cocktail builder application’ which turns the process of making a drink into a series of multiple choice steps. Once that exam is passed, the Wired program is complete. The day Live day itself breaks downs into two parts: sessions with the BAR Partners in the morning and then the final exams in the afternoon. It’s a very full day for everyone involved. By the time I was brought into the judging room, I was pretty frazzled. I was also super happy when my practical was over. I was free to head into the hotel bar and have a cocktail on our hosts, the lovely folks from Pernod-Ricard. One of the questions I’ve been asked several times since completing the course (besides did I pass) is whether or not getting certified has any value. I think by ‘value’ most people want to know whether the certification is recognized within the industry and would it help someone get a job. To be certain, passing BARSmarts Advanced is not like getting a degree from an accredited university. However, judging from turn out, this is clearly a serious program, started by some of the most respected people in the business and which serious professionals are wanting to attend. That in itself creates intrinsic value around the certification. I suspect as more people learn about and complete the program, the value of saying you’ve passed will increase. I would also say that there’s great value getting to spend a day meeting and networking with one’s peers and superiors. I met a lot of people I’d been wanting to meet and feel I made a lot of useful connections. 1- The second module, which covers all categories of spirits in one go, is massive and required reading it several times before I was confident I would remember enough to take and pass the on-line exam for it. It would be much better, I think, to split this module into two parts. Someone else in the course made the same observation during the Live day and suggested, quite reasonably, dividing that module into white goods and brown goods. Liqueurs, also covered in this module, could be made part of either half. 2- If you didn’t score perfectly on the on-line quizzes for each module, you were only told which of the questions you didn’t get right, not the correct answer to them. Worse, there are a number of questions of the form: “Which of the following is true:” or “True or False:” so you didn’t even know which question(s) you’d gotten wrong. 3- During the morning session we were given a couple of cocktails to try. It wasn’t really clear exactly why and to what purpose—i.e. did we really need to try a strawberry lemon drop? Since both were based on vodka, it came across as a bit of sales pitch to an audience possibly disinclined to sell cocktails based on this spirit. It was in fact the only time I felt ‘sold to’ during the event. 4- If feel the spirits tasting and evaluation section of the exam could have been better designed. In another life I was a very serious wine taster and attended biweekly blind tastings for many years. I found the format used for the written exam, a series of very specific multiple choice questions, to be less than inviting. I think the idea was that we were supposed to identify the primary characteristics of a given spirit by class (e.g. know that we’d been given a sample of gin rather than vodka). However, we all experience spirits (and wine for that matter) very subjectively and even experienced tasters aren’t always on their best game. Rather than making this part of the exam only about absolute right/wrong answers, I’d have found it more valuable if I had been asked to record my sensations of smell and taste as accurately as possible. Developing a good sense of ‘how’ a given spirit smells and tastes to us and learning how to communicate that seems every bit as important as the objective identification of a spirit tasted blind, which in practice will almost never happen when we’re at work behind a bar. One last thing thing I’d add: the printed workbook contains numerous typos, grammatical errors and some seemingly contradictory information. It would be good for all of that to be remediated at some point. P.S. As of this writing I have no idea if I passed. I *think* I made the cut but won’t know for a couple more days.